The TATRA BUGGYRA Racing team with their special Tatra 815 Buggyra racing truck won the 7th place in Dakar Rallye, the toughest world's motor race. Although originally aimed with higher expectations in the South American continent, the team piloted by Martin Kolomý is happy with the end result. 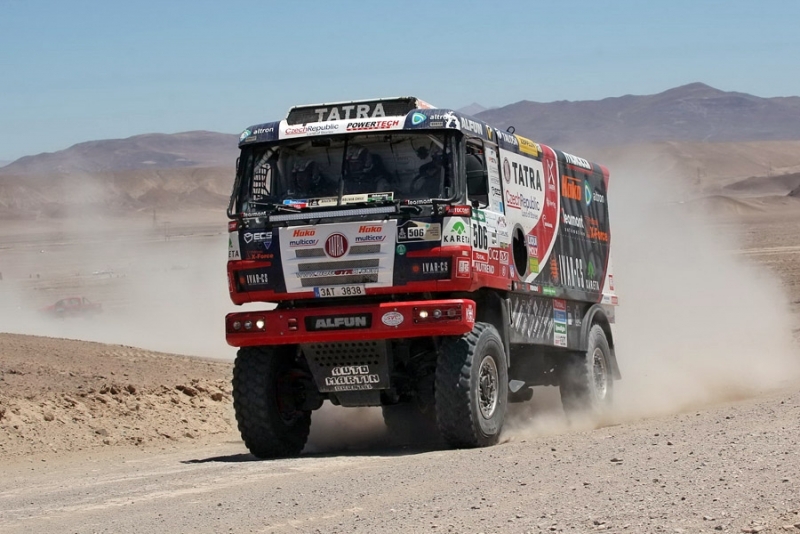 Despite minor problems and accidents in the 5th stage, TATRA BUGGYRA Racing as the only team managed to get into the top ten with the only racing truck. Buggyra ranks among the most successful European truck racing teams. Despite their connection with the traditional Dakar Rally participant and a traditional manufacturer of all-wheel-drive trucks, the TATRA TRUCKS company, they ranked among this year's Dakar Rally smaller teams. One racing truck, one accompanying Tatra truck. 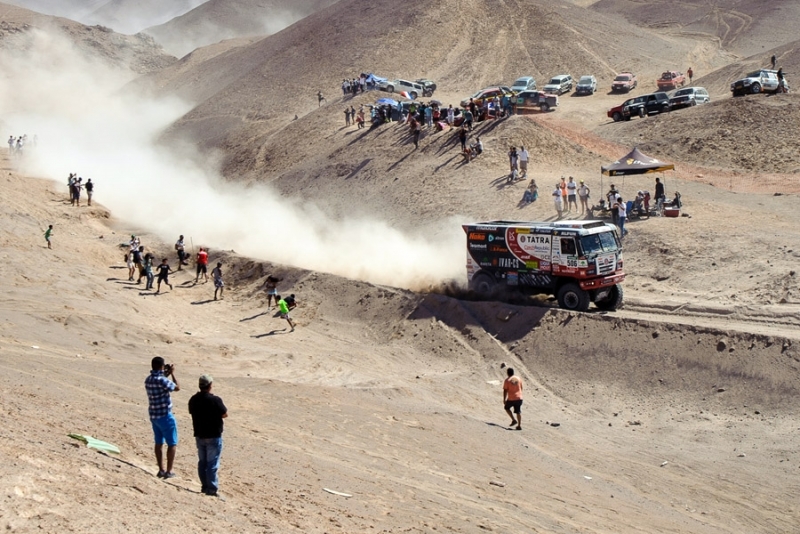 There are not many such ambitious teams which have a chance to rank at the top at Dakar. According to the driver Martin Kolomý, the team was disadvantaged by having to bring some spare parts and adapt the overall style of driving to that. "Given the sharp pace of the Russian Kamaz team and their teamwork strategy, I consider this year's finishing position to be a major success and I‘m looking forward to the next year, when we will be stronger," he says. TATRA BUGGYRA Racing’s Technical Director Robin Dolejš participates in the Dakar Rally for the fourth time. "We have fixed all the minor technical problems we had during these challenging stages. Given the size of our team and the lack of time, we always have to manage quickly," he says. The team representative David Vršecký, who took care of the setting of the racing Tatra, agrees the truck didn't have any major problem during the race. "Tatra 815 Buggyra works great, it's quick and reliable. Next time we will strive to improve the little things that didn’t occur until the extreme conditions of the race," he says. The team manager Jan Kalivoda agrees and adds: "The Tatra chassis withstands just anything." The other team members especially appreciated the easy to maintain suspension, particularly during the marathon stage, when there weren't service facilities. The special racing truck TATRA BUGGYRA RACING, which is based on series-production model T815 4x4 with short cab, completed Rallye Dakar 2015 with 12.5-liter engine GYRTECH Rally Power MK14-3EC, with the power output 900 hp and torque 3,800 Nm. Martin Kolomý was changing gears using a modified 16-speed ZF/GYRTECH 2014 air-assisted manual gearbox. The vehicle was equipped with a single-speed TATRA drop-box. Independently suspended half-axles are sprung by air bellows like the mass-produced vehicles TATRA PHOENIX, however the racing truck uses REIGER shock-absorbers. The curb weight is 8,500 kg with distribution of 50:50 to the front and rear axles. The TATRA TRUCKS truck maker tested not only the drop-box, but also other new components on this special truck bearing the racing number 506: front axle and some steering components. "We are glad that in terms of vehicle performance the testing has been successful, and we will address the details after the special's arrival in Kopřivnice. The feedback from the racing team is very important for the further development. If the components prove to be useful in extreme race conditions, they will be used in the serial production, for example, TATRA PHOENIX Euro 6 vehicles," says Radomír Smolka, the Engineering Director of TATRA TRUCKS. 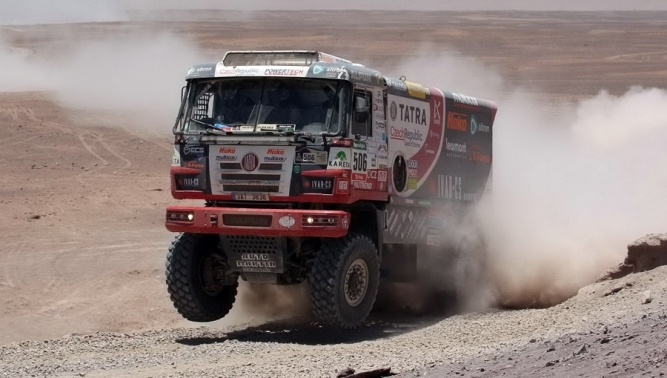 The testing of the components and the whole assemblies in challenging long-distance competitions such as Dakar Rally has a long-standing tradition at the Kopřivnice truck factory and the findings are regularly implemented in mass production and in the development of customer specials. Based on the tender held in March last year, TATRA BUGGYRA Racing with Martin Kolomý and the Kiliáns brothers was appointed the official team supported by TATRA TRUCKS. In addition to the quality of the racers and the management, Tatra sought the team with the greatest motivation to gradually improve, which corresponds exactly to their business philosophy. As for the machinery, during almost 4,500 kilometers it several times convinced everybody that Tatra doesn't find a way, it makes one. The entire course of the race is recorded at www.buggyra.com, including an extensive photo gallery. The joint-stock company TATRA TRUCKS has owned the world-famous truck maker Tatra since March 2013, when they acquired the company in an auction because of unpaid debts by the former owner of TATRA a.s. The new owners (Czech entrepreneurs Jaroslav Strnad and René Matera) and their key executives managed to resume production in the first half of 2013 and regained the trust of banks, subcontractors and customers. Now with the Czech owners, the company is undergoing successful restructuring. As of December 31, 2014, TATRA TRUCKS employs approximately 845 full-time employees in the parent company and less than 500 in two subsidiaries primarily focused on casting and forging. In 2014, revenues amounted to CZK 3.7 billion and the company sold 850 and produced 821 vehicles. The productivity of labor has increased by 66% YTD. At the end of 2014, the sales of new generation Phoenix EURO 6 vehicles were launched.